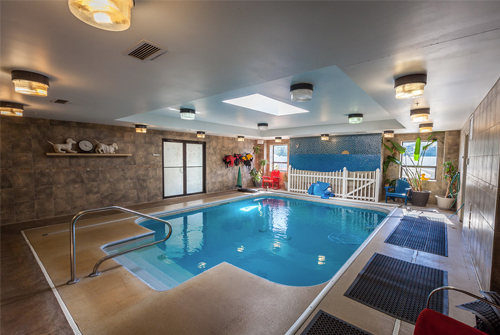 Your dog will enjoy time at our Aquatics Center which offers supervised private Fun Swim splash time or Fitness Swim. Warm water exercise is ideal for arthritis, improving flexibility, increasing endurance, weight loss, relaxation, building confidence, athletic and general overall wellness. Please visit the Association of Canine Water Therapy for further information. Fun Swims are exactly what they sound like – fun! Your dog can experience the joy, rejuvenation and exercise benefits of swimming. This option is best suited for dogs who simply enjoy being in the water. Our sessions are approximately 20 minutes or 30 minutes long and include splashing in the water, directed play with our Fitness Practitioner and may include treats & toys. Sessions are by appointment only and can be scheduled individually or combined with boarding, daycare, grooming or other amenities. Dogs in the same family can swim in a group for even more fun!